Why choose Nappynat Protective Cream? A good soothing and protective cream is a product that can be extremely useful for taking care of baby's delicate skin during the winter months, and in particular as a shield against atmospheric agents that might affect the skin. There are numerous creams on the market promising protection for sensitive skins, but how many of them are really just nice packaging or a pleasant fragrance, with all the soothing properties of pure water? 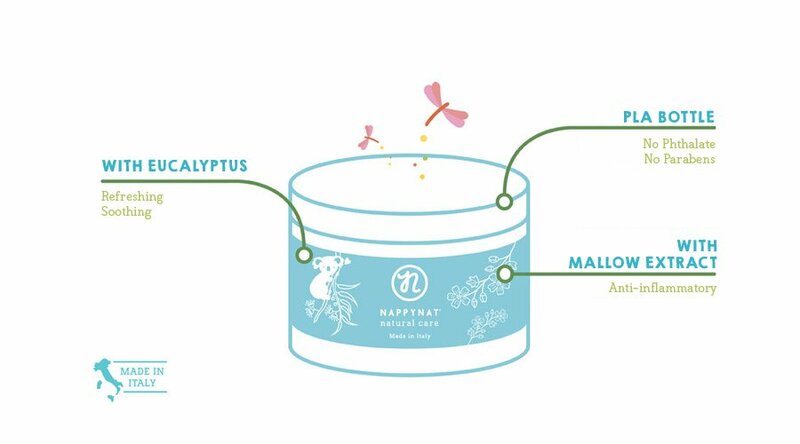 This is why for its Protective Cream, Nappynat developed a certified organic formula, dermatologically tested and analysed, for the protection of mums' and babies' hands; enriched with refreshing essential oils and the fragrance of eucalyptus, this cream is highly effective thanks to the use of extract of almond oil and plant-based, GMO-free raw materials from organic farming. Product Description:HELENVITA BABY ALL OVER CLEANSERCleansing liquid / Body and hair / Cotton e.. Product Description:HELENVITA Baby HANDS CLEANSING GELExtremely mild cleansing gel, specially d.. Pleasant and gentle body wash enriched with refreshing eucalyptus essential oil, ideal for the delic..
Baby body shampoo with Eucalyptus, Aloe and Mallow extracts 450mlGentle shampoo for the care and cle.. Product Description:HELENVITA BABY BODY MILKSmooth body milk / Cotton extract and blueberr..